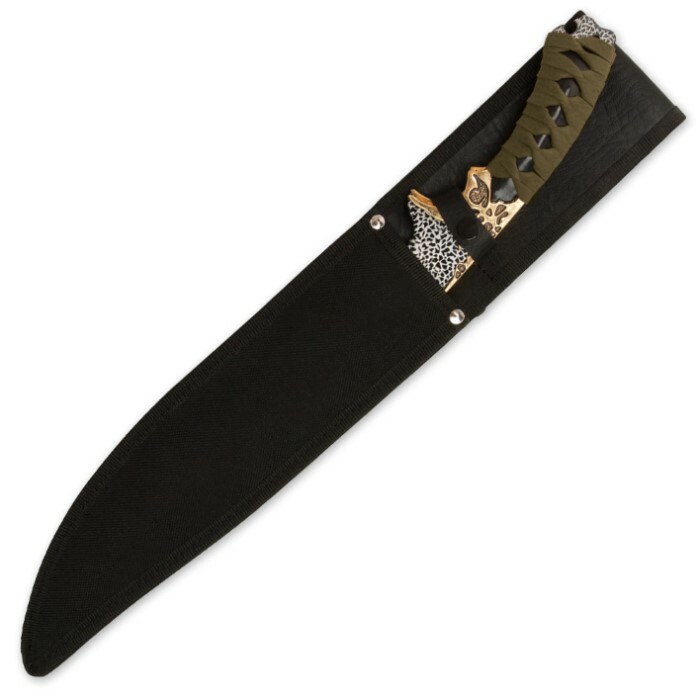 Jungle Suede Flyers Twin Sword Set With Scabbard - Crackled Black Finish, Suede-Wrapped Handles, Gold-Plated Accents - 19" Length | BUDK.com - Knives & Swords At The Lowest Prices! This 2-piece set of Jungle Suede Flyers is the perfect combination of wild power and fierce prowess! Take these blades wherever you go, and watch these twins get at it! Received these this week and am quite impressed by them. 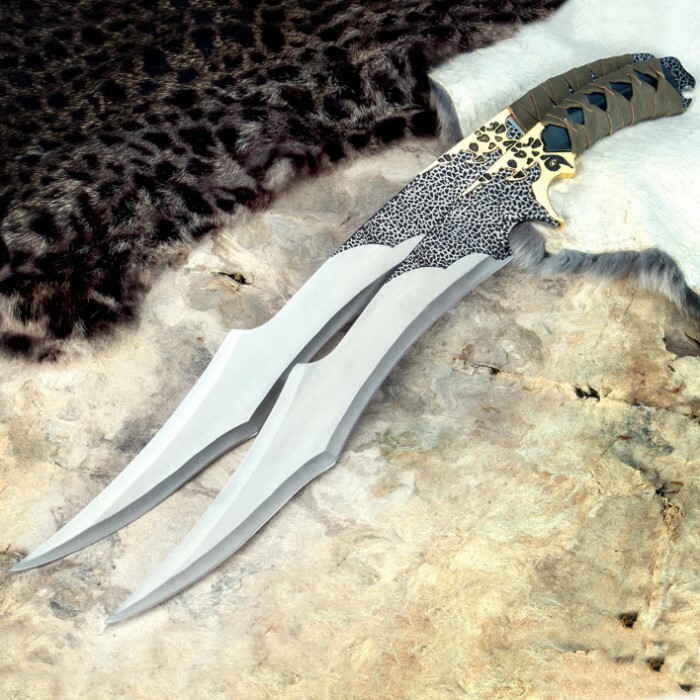 They're 19 inches long and look awesome! Quite the deal! Love them! AMAZING! They are pretty sharp, so okay for cutting and slicing. The look is really otherworldly, and the pictures do it no justice, the wrapping on the hilt is a bit loose, but not really that much (unless you're planning to join an elven army, that is), but I plan to display them, so not a big deal. 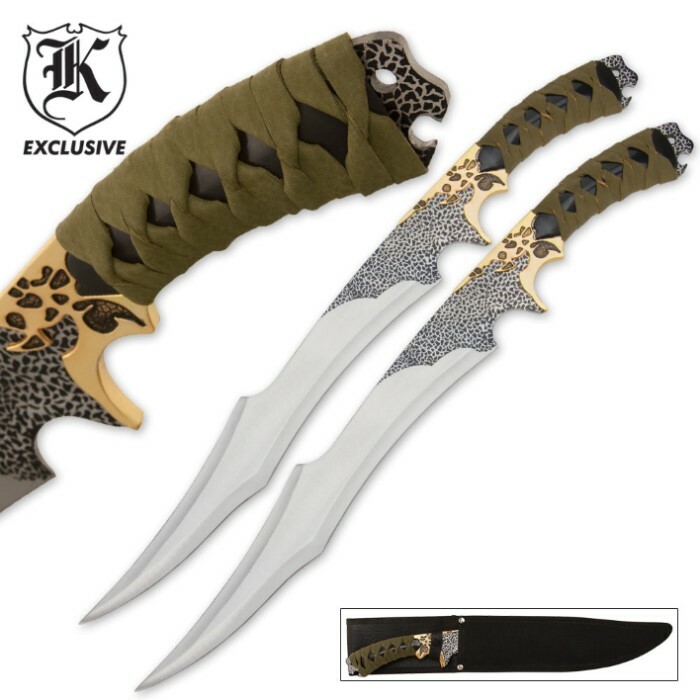 Overall, buy them NOW, GREAT price for two, pretty sharp 19 inch swords. Another satisfying piece to add to my collection! The swords themselves look amazing! However the wrapping they used is rather flimsy and feels like it will fall off at any second. I would suggest wrapping it yourself if you have the skill and time to do so. Still though, nice looking piece! Response: We apologize for that, the item should not have been listed as being engraveable since there are two blades, that has now been updated. Great decoration piece. Fast shipping like always. It is well worth the price. Only bad part is I am having trouble finding a wall plaque to hang them. This should not defer you from buying this. Just recieved the swords. Have to say they were more than what I expected. they were very sharp and made beautifully. together or seperate they make a great piece of art on my wall. thanks again!! True Swords for and awesome buy. The swords are what was advertised, however there was NO mounting plaque when I received mine, just the nylon sheath. I guess I'll have to make my own. These twin swords look great stuck to a wall, but that's all they're for; to look at. They are a bit dull, short, and a bit cheap looking up close. They're fun to show off to friends who appreciate such collectibles but I do not highly recommend. I was also disappointed that the handle is half rounded, half flat; the back of the sword's handles are flat and makes it very uncomfortable to hold. Conclusion: Fun to get for twenty bucks, but do not highly recommend.